Plumbers corner will updated on a regular basis with interesting and sometimes "vital" information from David Griffiths. These tips will help homeowners identify situations where a licenced plumber is recommended, and smaller tasks that a handy homeowner could handle. Stay tuned! Q Is it necessary to shut off the water in the fall for the outside lawn service? A Yes, to prevent freezing you should turn off the water from inside the house & then open the faucet outside. Q. I have heard of people shutting the water off in their home before going on vacation is this necessary? A It is not necessary, but is a good idea incase a pipe were to burst or the toilet tank was to crack. You would not have to worry about water damage. Q. The tiles in my bathroom around the tub are falling off the wall, & I am afraid of water damage. Is there a way of fixing this problem without the expense of re-tiling? A. Installing a vinal tub surround would be an option & most of them can be installed yourself. Q. Is it necessary to drain the tank on the hot water heating system once a year? A. No, it is not necessary, but the cushion tank should be drained. Q. I have had a problem with freezing pipes in my house - is their anything that I can do to help prevent this from happening? A. In extremely cold weather & a problem persists, open faucet to a gentle "trickle" in area of freezing. This will keep the water moving so it won't freeze. Q. I just purchased a cottage and I now have to close it for the winter - what steps can I take so that my pipes and toilets will not freeze? A. Plunge toilets to lower water in bowl & install anti-freeze in toilet bowl, tank & into traps & anywhere that water collects. E.g. : washing machine & dishwasher. Check back soon for more tips! 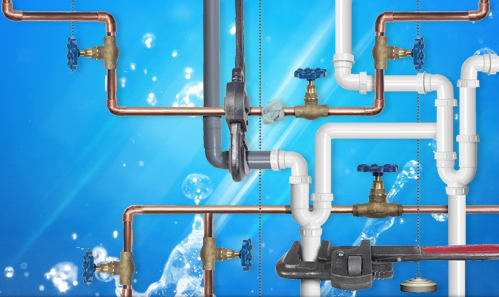 Our services can include bringing the plumbing services into your home from the street, all of the roughing in and installation of the fixtures. Our plumbers are trained, efficient, quick and polite. We will take as much time as each job requires, not a moment too soon. 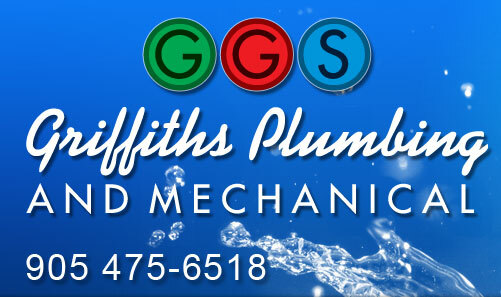 Griffiths Plumbing is excited about the advancements in providing our customers with eco friendly plumbing options.